First off, I’ve neglected keeping my Blog up to date. It’s been going really slow with a long dry spell and now a ton of rain. Finding new places to hunt has been tough. I managed to find a couple of pockets in old parks that yielded a couple of Mercs, a Rosie and a very worn Standing Liberty Quarter with no date. (Thats two now with no dates, bummer) Mostly I’ve been hitting the same old places and picking up what we’ve missed. I picked up a Barber dime that was only 3-4″ deep around a tree that was been hit before. It was about 4″ from trash and I found it because I went from a different direction. Makes you wonder how much is missed? I guess that’s what keeps me going back to the same ole places. I did hit an area park that was created in 1951. I hunted for an hour or so and was about to give up when I got an interesting signal. My numbers were 1-44, 1-45 and then 12-46 and trash numbers. I previously dug two old smashed cans with similar numbers, but this target hit 12-46 a lot. It was hard to pinpoint so I dug a large plug. As I pulled the plug I saw a large silver coin fall back into the hole. It was a Walking Liberty Half and I nicked it despite the large plug. A wheat and pull tab was in the plug also. The half was dated 1945 and the wheat was 1952. I can only assume people were still carrying Walkers in the 50’s. Hopefully my finds will increase and I will try to do better with my blog. I still have a long way to go to hit 100. The weather this winter has been pretty mild and I’ve been trying to get out as much possible. 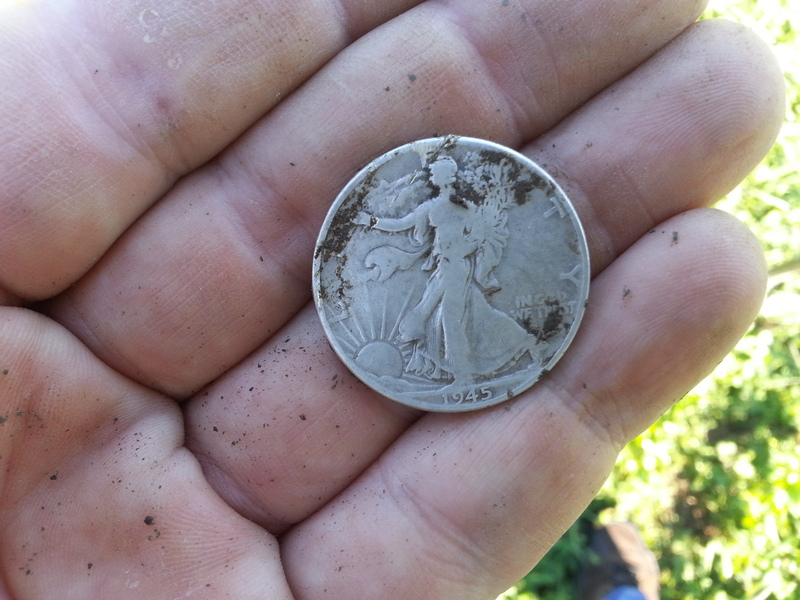 Hunting in the woods has scored me a couple of silvers in the form of a Merc and a Walking Liberty half dollar. Finding a silver half dollar is such a rush. When you struggle to find a silver quarter and find a silver half, you thank your lucky stars. I also managed to find a silver rosie in a 1950’s yard. Other notable finds came in a form of a Missouri tax token and a Catholic rosery. The rosery was a surprise since I found it in the woods too. The wooded area I’ve been detecting is very large and I’m hopeful to find even more cool stuff. This year is going to be my year of “firsts” metal detecting. I hit a deep 12-46, 11-47 at 6-7″. I thought to myself, “thats a deep clad quarter!” As I circled the target my numbers started hitting, 10-46, 8-46, 1-35, 1-47 etc. Has to be a deep silver quarter. So I dug my plug, pin pointer chirped at the bottom of my hole of 5″, another good sign. My second scoop of dirt revealed a silver rim of a quarter. Thinking it was going to be a silver Washington, I was very surprised to find a 1899 silver Barber quarter. My first one!! I’ve waited a long time to find one if these puppies. So I searched another 45 min and hit another spot with silver quarter numbers. Having thoughts of another Barber quarter running through my mind, I was slightly disappointed finding a silver Rosie. (I would have been jumping for joy last year. Its amazing how our expectations change in a year!) I thought to myself, silver quarter numbers from a silver rosie at 4″? Sure enough, another silver was in the hole, a Merc. Then another! I ended up pulling a silver Washington quarter, 2 silver rosie’s, a merc and a buffalo nickel! My first larger silver coin spill! Here’s the dates – 1916 Buffalo, 1941 washington, 1944D Merc and 1950, 1953D Rosie. Since 1953 is the most recent year, does that mean in 1953 mercs and buffalo nickels were still being carried around? I’ve changed my hunting pattern to hitting the woods surrounding old parks. It takes a long time to hit a target, but its been paying off for me. Plus, I’ve found a few Morel Mushrooms to boot! The weeds are down, so its now or never for these areas. My goal is 100 silvers this year, so I’d better quit typing and get to hunting! Good luck! Finally, A Big Silver Fish! I thought my exciting news was going to be about going out of town, hitting a really old park and finding a Indian Head penny and a silver Washington. That was until yesterday when I pulled a 1943S Walking Liberty Half! That’s my first large silver coin and it made my weekend. This last weekend was looking pretty bad since I hadn’t found an old coin until I hit the silver half (it ended up being my only old coin for the weekend). Since my last posting, I’ve found several silver coins and wheats at various parks. The weekend before last, me and my brother went to an old small town park dating in the late 1800’s. I was pumped, surely there must be a lot of silver coins. It was cold, ground was frozen and it was one of the cleanest parks (not much trash considering the age) I’ve hunted. Someone or others had cleaned it up good, maybe looking for gold rings. Modern coins were mostly pennies and I did manage to find a 2″ deep clad half dollar (another first) that must have been passed thinking it was trash. After several hours, I hit a deep signal that turned out to be an 1903 Indian Head penny and a 5″ iffy signal that was a silver Washington on its edge. 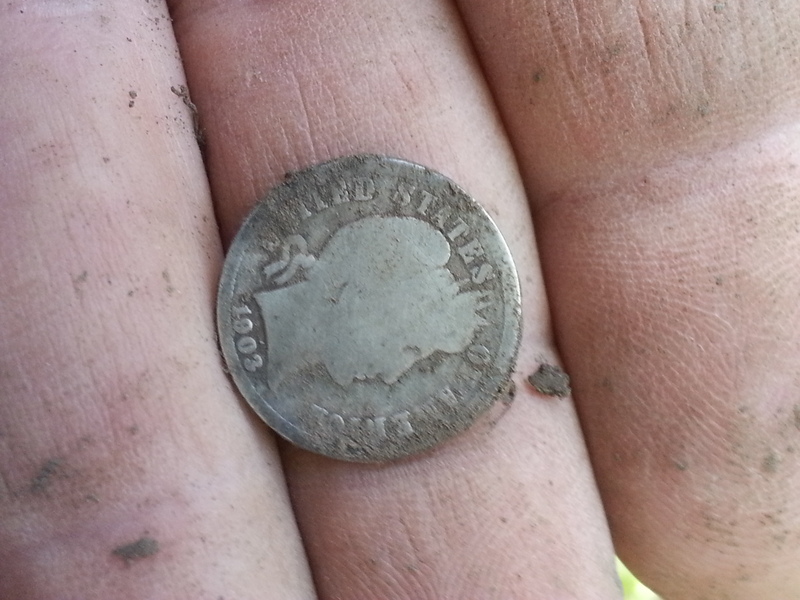 I was lucky to find the silver quarter, had I approached it from any other direction I would have missed it. As I circled the target, I only got a decent signal from one side. It sounded like silver, but it didn’t a 100%. I was just lucky and being curious payed off. I’m at 17 silver coins and trying desperately trying to keep a good silver pace. 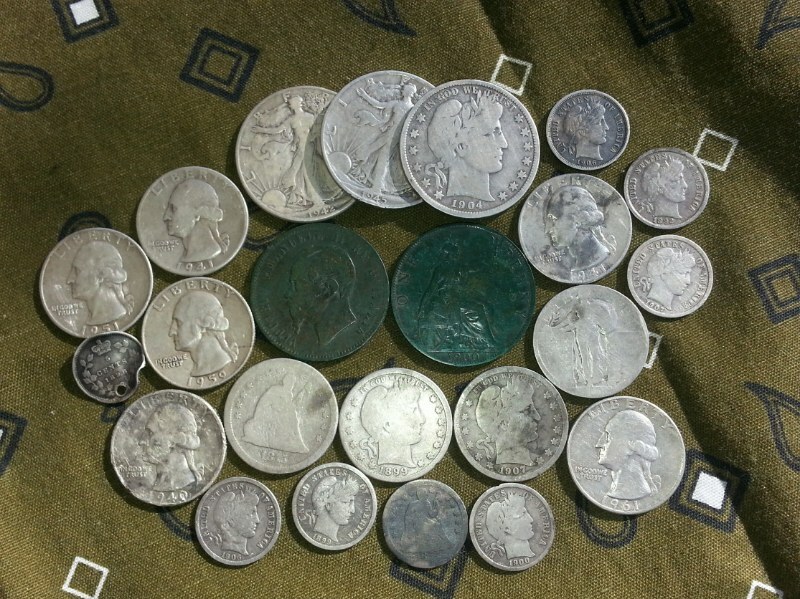 My goal is to beat my last years finds of 74 silver coins which is going to be tough. So I will stay at it. Best of luck! BTW – I did find a Chicago Transit Authority token. Kinda odd since it was found in an old Kansas City Park. It was at about 5-6″ and rang up in between foil and Nickel numbers. Odd sounding and odd numbers prompted me to dig it. I’m glad I did. So when in doubt, be curious and dig it. You never know…. Wouldn’t it be nice to be able to find silver coins as frequently as clad coins? Since that place isn’t in my zip code, I have to try different means/tactics to find silver. I hunted a house built in the 1920’s with a large spacious front yard with old large trees. A perfect setup for old coins to be lost by kids, people doing yard work etc. I pulled a 1938 silver quarter, two silver Rosie dimes and a couple of wheats. I was hoping for so much more considering the age, size and layout of the yard. I found most of the coins in areas I would have considered the least likely for coins. The quarter was found by a gravel driveway on the edge of a narrow strip of the yard on the side of the house. Not a convenient place to park and reach the front or back doors. One Rosie and a couple of wheats were in the same area, but closer to the house in that narrow strip of yard. Narrow by the standards of how large the front yard was. Really not an area where any activities I can think of could be done. The other Rosie was just off of the front porch and deep mixed with old nails. It was a bear to detect and find. The areas I considered prime like the front yard and the smaller back yard where people parked only turned up a wheat and a few modern coins. Conclusions, the prime areas has already been metal detected or those two areas had been disturbed by some form of landscaping. If it’s already been metal detected, they missed two silver coins by not covering the whole yard just because it didn’t look the best. I went back to a newer park where a 1935 map showed five houses used to be there. I hunted the heck around the new picnic tables and swing sets etc looking for old coins. I did find a war nickel and a wheat previously near some old large trees where the ground wasn’t really moved much. Behind were the houses used to be and is now part of the park is a large open area with old trees. A few of the old trees are arranged in a fashion that could represent the outer boundaries of a large backyard. I started noticing iron hits that could be nails and then I hit a silver dime signal. Yep, a mercury dime! I started searching like crazy for more even digging iffy signals. Nope, it was just a randomly dropped silver. I used the same strategy last night at a old Catholic Seminary that is now a school to find another Merc. It was in a far corner by some old large trees and a drive entrance to the parking lot. Just one silver, another randomly dropped silver. Of course I found a few modern coins also, still random drops. Most people don’t hit those areas, not enough excitement I guess. Did you notice the other correlation? Old big trees, most people who landscape avoid them because of the roots. So any thoughts? Better strategies? If you want to share, I’ll listen.